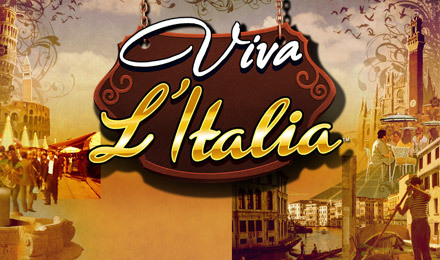 Take an eye opening tour of Italy with the Viva L’Italia slots game! Keep spinning and land on Wild and Scatter symbols, trigger FREE SPINS and a Bonus Round, and enjoy that pasta! Catch the travel bug and venture to all the best Italian sites when you play the Viva L’Italia slots game! The 5 reel 25 payline game will take you on a whirlwind ride throughout the entire country. Enjoy classic Italian themes and icons like the Leaning Tower of Pisa and the Colisuem. Float through Venice in a romantic gondola ride while you spin to win and grab up Wilds and Scatter symbols! Trigger FREE SPINS in a Bonus Round, and be sure to bring back a nice souvenir with your winnings!